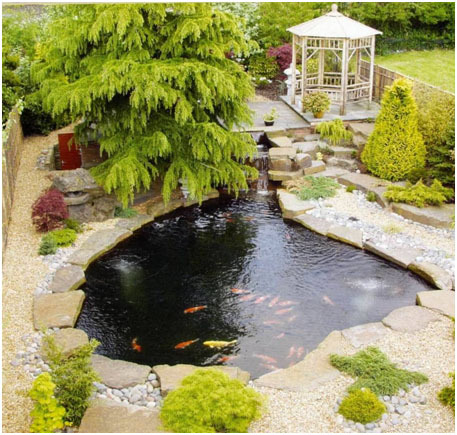 There are other vital items required in designing and producing the perfect pond apart from the filtration system and the pond base and drain/s. Here are the ones we will always need, there are multitudes of ‘others’ advertised and promoted to the beginner but you will not find them on this page and I have valid reasons for NOT including them because simplicity is the real key to a perfect system. This provides the pulse and heartbeat of the entire system. Water pumps are made today that far ‘out-perform’ those of days gone by, with lower purchase price; longer guarantees; the ability to produce and handle greater volumes of water, together with significantly reduced power consumption. They are also manufactured to be in operation permanently. The choice available today, whether submersible or external, is great. Manufacturers always produce bench-tested performance details with their pumps. Please do bear in mind that maximum output volumes are given which always state that these are without any fittings fitted to the outlet of the pump and are always given at nil head. The pump shown here is an example of a cleverly-designed modern unit that can be installed in both submersible and external applications. 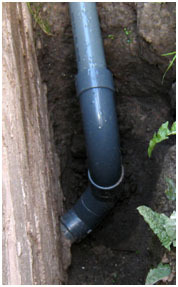 ‘Friction-loss’ by way of long runs of pipe work and fittings can be significant in Koi pond systems and one can obtain real increases of flow rate performance by incorporating long radius bends rather than 90 degree bends throughout. Also, by increasing the bore of the pipe work above that recommended by the manufacturer, a maximum flow rate can easily be achieved. 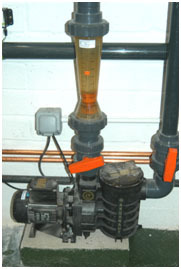 This picture shows an external water pump where delivery output is regulated by a pre-set flow-valve in order to control specific flow rates for a particular filter box. 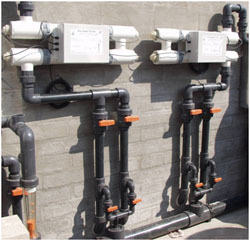 Do try to use ‘pressure’ pumps as opposed to domestic central heating motors that are, at best, only ‘circulators’, and, as such, do not readily cope with large bore pipe lines used in Koi ponds without severe loss of performance. In my experiences of pumps & claims made, if one requires a flow rate of say, 1,250 UK gallons per hour through one’s filter system then opt for a unit claimed to deliver a maximum output of 1,600 UK gallons per hour or over, for this particular task. In many modern-day Koi pond designs, certain biological medias do require a specified volume of flow rate in relationship to the available surfaces and the amount of ammonia dissolved in the water to ‘feed’ the biomass on those surfaces. In short, we need a constant supply of water to service these surfaces on an accurate ‘dwell time’ and this is usually safe around 10% plus or minus of the recommended flow rate specified. We need to know, therefore, water supply per square inch/cm of surface per minute in order to arrive at ‘dwell’ or retention time on all the surfaces. I have long-since disregarded manufacturer’s performance claims, as all my pump installations require the essential lengthy pipelines and fittings used within a Koi pond. There are only two real ways to accurately check the flow rate of any pump in a particular application. If enough room is available, mark a line on a plastic bucket to where, say, a three-gallon level has been measured. Start the pump to discharge water into the bucket and time this with a reliable watch. When the 3-gallon mark is achieved, then note the time taken and the true flow rate can then be determined by a quick calculation. The next way is more accurate by way of a specialist ‘flow-valve’ as shown above which allows full control of water supply volume from the particular pump. As mentioned earlier, one can safely restrict and control water output of any pump by adjusting it with a valve or a flow-valve after the delivery output line but never by restricting the suction inlet. This action will starve the necessary available water supply and also invalidate any warranties given by the manufacturer. It is also worthwhile to note that pump impeller housings are a good home for water snails and crustaceans especially when used in pond situations. It is always useful to make annual checks here to remove them as they can impair output performance. The UK water companies are also aware of this and periodically flush these out with a dilution of caustic soda although, by the time it reaches our homes, it is harmless. 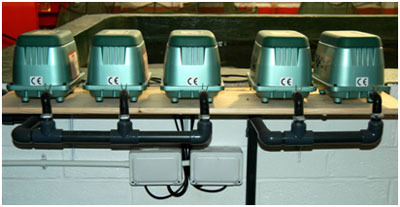 These units can be installed above pond water level as it is supplied its water by a pump. There is little else to say about this item of Koi pond filtration except that it does do what it claims in respect of eradicating periods of green water. Your local supplier will make recommendations as to the size and make of a unit required to serve your own system volume. I have always found the ranges offered under the ‘TMC’ name are both very efficient and reliable. Do bear in mind that most bulbs have to be changed at around six monthly intervals in order to perform at maximum efficiency. In view of this do install them with ample space where removal and replacement of bulbs can be carried out without the need for cutting pipelines – ‘union’ fittings come to the fore here. In cooler periods of the year where sunlight is reduced, these units can safely be switched off to conserve running costs. Do be under no misconceptions here; these clarifiers are simply for removing ‘blooms’ of green water. 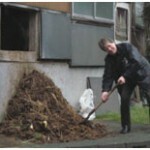 They have no effect whatsoever on the destruction of any water-borne parasites nor any good or bad bacteria. I have also never seen any proven reasons to date for switching these units off prior to adding chemicals for the eradication of parasites within a system. The above units must not be confused with the more expensive ‘Steriliser’ units that are readily available for purchase today. Providing flow rates are observed for these units, it is possible to eradicate some parasites and even good/bad bacteria – but they do not differentiate between. I can only see the value of these to a Koi pond system if all the Koi are allowed to swim through – very slowly! These units should be installed in a completely different pump line to the main filtration items. They are especially valuable in summer when high amounts of floating surface debris can be seen, or in autumn to catch leaves. Skimmers can also be switched on and off as desired. In truth, this unit should also be combined with other forms of Koi pond filtration such as U/V and heater units. 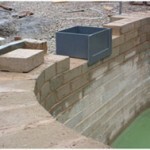 Skimmer wall installation using a standard swimming pool unit. Several enthusiasts have designed and fabricated their own models for some years now but the majority of units in operation today for Koi ponds are those produced for normal swimming pool applications. 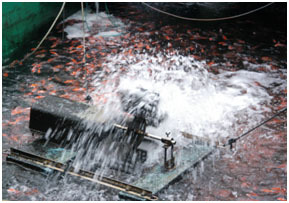 It is fitted usually with a face plate which incorporates a grille to prevent intake of small Koi. The skimmer is usually powered by an external pump where surface debris is taken in by suction to be collected in a basket to the rear of the skimmer and the basket can be emptied by hand as and when required. Autumn is a time of year when these units become valuable in removing floating leaves where they may require emptying daily. The ‘throat’ of the skimmer can be seen here on the left and the emptying of the basket is shown on the right. This picture shows a custom-made skimmer unit, which is far better in usage for Koi pond applications than the swimming pool model. Once again, the pump line used for this equipment can also be employed in supplying water to any other items of equipment that may be required before final return of water to the pond. Whether you choose to heat or not is your decision but I would always include some form of readily-available heating to any serious Koi pond. I have also included this as part of ‘Koi pond essentials’ to be there in case of emergencies should the need arise and may well put your Koi collection at risk of future health issues. Without going into very great details here, Koi are a ‘temperate water’ species of freshwater fish as opposed to being genuine ‘cold water’ species. Add to this the fact that man has genetically interfered with the original Carp (cyprinus-carpio) in order to produce colours. As a result, Koi are not nearly as hardy as their wild forefathers and do require special care, especially in very cold water temperatures. This is similar when comparing the hardiness of racehorses to wild horses or pedigree breeds of dog to mongrel breeds or their forefather the wolf. Pay very little attention to those who profess Koi ‘hibernate’ in cold water periods. And here, once again, is the picture to show my views on the above comment. The truth is, if Koi can be seen huddled together motionless at the pond base in cold water temperatures, they are in serious and agonising distress – they are also becoming physically weaker by the day. Dormice, squirrels and bears hibernate but not one single species of fish life do! I would never suggest you allow your Koi to be subject to less than 50F/10C temperatures of pond water. 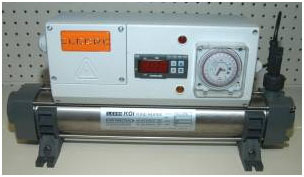 If very cold water conditions to arise from time to time and the heater is installed at the outset, the facility of increasing water temperatures is always to hand as an emergency measure. Some milder winters may produce air temperatures that will not give any real cause for concern and so usage of this item may not be required but it is a real comfort to know it is there if ever required. Also it is far more economical to start the heater at, say a pond water temperature of 10C if a cold snap is expected and then allow the thermostat to take over. 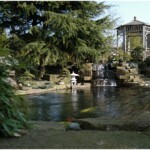 It is far more costly to allow a body of water to drop and then have to heat the entire pond back up to 10C. Thankfully, over the passing years, it has become more and more apparent to me to be, probably, the single most important aspect of a ‘proper’ system. 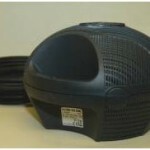 I hasten to add, I have no financial interests in the purchase and sale of air pumps. The Takatsuke Company under the trade name of ‘HiBlow’ made the ones I first introduced to the UK in Japan and these are the units I have had the most experience with. If required, one can purchase non-return valves specially manufactured for air supply lines that will allow them to be sited below final water level. More information will be detailed as to installing aeration to the specific system we are using later. I also hear from time to time of ‘HiBlow 40’ units still providing constant service even after 22 years of constant and un-interrupted service You can see in the previous photograph that the standard ½” outlets from the pump have been increased to 1” rigid lines and continued right through to the diffusers. Please do not use standard aquarium airline with these units nor the multiport valves supplied with some – they are useless if maximum aeration performance and long-life of the pump is to be achieved. Supplementary aeration is provided to my own pond by means of the waterfall and four aerated diffuser drains as seen here. This paddle aeration system is widely used by the Japanese breeders for their smaller Koi stocks that are kept in heated ponds over the winter period and fed around four times a day. On many occasions in the past I have made several water tests on both Japanese mud ponds and the breeder’s indoor systems despite the fact that I have never once seen a Japanese breeder make checks on any aspect of water quality in either mud ponds or indoor systems (even when fully loaded with huge stocks after an autumn harvest) and all I have found is very minute ammonia & nitrite readings and an equally low nitrate reading – far lower than we are used to in the UK. Upon asking several breeders as to why they always use heavy aeration in their indoor ponds they simply reply to say – ‘It is far better for the water and the Koi’. I have always suspected that increased dissolved oxygen content significantly reduces nitrAte build-up in a system. 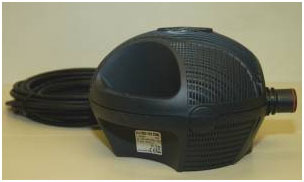 Today, there are many other brands of air pump available which are very similar in appearance to the original ‘HiBlow’. Brands such as ‘Secoh’ and ‘Medo’ spring to mind here but I do not know where they are manufactured nor their reliabilty. It is perhaps best to discuss the pros and con’s of each make with fellow Koi enthusiasts and Koi dealers as to which brand represents good value together with proven, lasting performance. Incidentally, it is an impossibility to even get near to ‘super saturation levels’ of dissolved oxygen content if aeration is added by air pumps – even hundreds of them. The only time I have ever witnessed these potentially lethal levels is by the addition of pure liquid oxygen. 6. 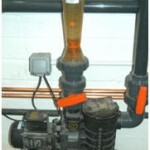 Pipework, valves and fittings. Steer well-away from ordinary domestic household makes if to be used for Koi pond applications and instead use the far more robust UPVC ‘pressure specification’ items shown here which are produced to retain water at all times instead of being used for simple drainage applications. These are installed by joining them together with purpose-made solvent cement that ‘fuses’ one to the other for a permanent watertight seal. 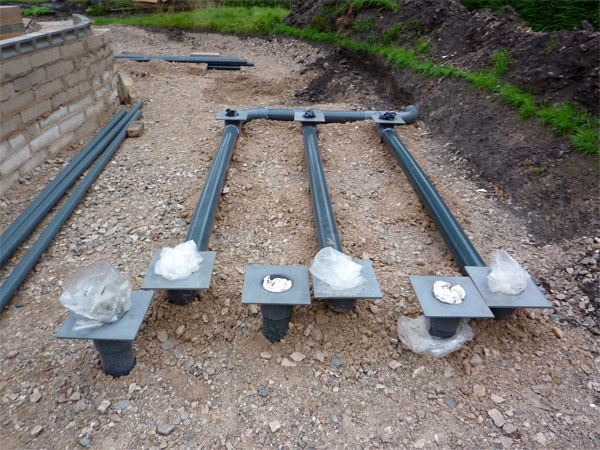 The layout of pipelines in an equipment housing can also be made to look very neat and professional by including the pipe brackets available and these can allow the lines to be clipped to the wall. In recent years the old-style rubber connectors with circlips/jubilee clips have come into use again, they serve a purpose but I personally find them cheap and nasty to live with visually. Do also bear in mind that items such as water pumps, U/V units and heaters may need to be removed from time to time for periodic servicing or cleaning. It is wise therefore to fit ‘double union ball valves’ before and after each item to allow for this without having to saw the tube and then replace it afterwards. Furthermore, avoid ‘Slide Valves’ like the plague. Please believe me, they ALL fail sooner or later and removing them can often be difficult. 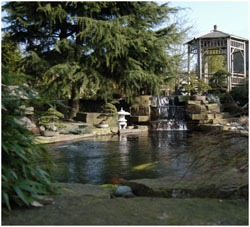 In some cases this requires most of the pond to be emptied after the Koi have been removed into other suitable containers. If you need to use valves then use ‘proper’ Ball Valves as opposed to many very cheap versions of these sometimes available at some Koi outlets. This can also be a minefield for the new enthusiast as these are produced by many different manufacturers from different countries and offered in a range of prices. As with anything the cheapest is never the best and this applies here. The actual make I have found to be superb throughout my involvement with these are manufactured in Germany under the ‘George Fischer’ trade name. I know I am guilty of ‘over-specifying’ the pipeline requirements of an in-ground Koi pond but, from experience in the past, have found my specifications to be almost ‘bomb-proof’. 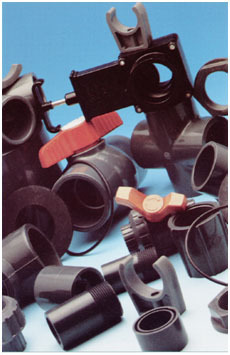 In the mid 1980’s when I almost succumbed to becoming a Plumber’s Merchant instead of a Koi Dealer, I was invited by the GF company to attend a three day course where I would be taught every aspect of installing and understanding all their pressure pipe and fittings range as well as having the tricks of the trade demonstrated. The majority of attendees had to pay for the pleasure whilst I (their leading customer in the North West of England) was flown down and wined, dined & cosseted in the best hotel room available. It also taught me a thing or two about something many term as ‘sticking some bits of plastic together’. Installations such as this apparently simple task are not so simple when 4” long radius fittings have to be connected to be perfectly level on completion. In most cases one only has one chance to connect correctly and with 4” bore lines this is a two-man job. 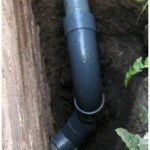 Do use the pipe cleaner that is available on all joints before applying the solvent cement to the fitting and the pipe. 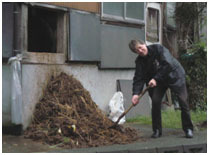 Whilst drain ‘feed’ lines have been covered in earlier texts the return lines also require an explanation. Obviously we should keep these as short and as unencumbered as is possible and the pipe bore should also be large enough to pass the water back into the pond. Whilst many pump delivery outlets are in 1.25” or 1.5” diameter, I have always increased this to 2” by fitting the appropriate reducers. Return currents are vital for good pond circulation, whether you choose ‘clockwise’ or ‘anti-clockwise’ is neither here nor there. It works either way – discount the old chestnut about flow patterns in different hemispheres. On reflection, it does deserve another picture. I have witnessed first-hand the significant benefits that can be made in small surface area, circular ponds by adding ‘reverse-flow’ return lines to the pond. Valves that are alternated at monthly intervals to change the flow direction of the pond between clockwise and anti-clockwise control these return currents. On one instance, a collection of magnificent Koi were visually compromised in one such pond where the strong, one-directional circular return flow produced a real distortion in the body shapes and this increased as the months passed by. The Koi were swimming along the circular pond walls against an incoming clockwise flow of water and the right hand sides of their bodies (as the Koi faced you) were becoming much more pronounced than the left hand sides. As ‘body shape’ is a prime consideration, reverse-flow lines were added and used. It only took another 3 months before the enlarged muscles returned to normal shape. I must point out here that it is only circular-style ponds with a smaller surface and high return currents that are usually affected with body shape distortions on the Koi. 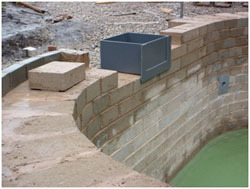 This shot shows correct positioning of clockwise return lines at mid-level of the curved pond wall and these are supplied with pre-measured end plates to fit flush to the pond walls before they are finished. The walls can now be completed and the lines connected at a later stage. 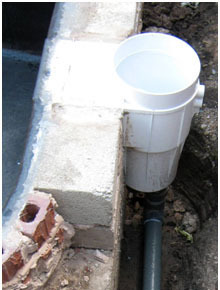 This shows a 2” return line positioned in the pond wall to provide an angled clockwise return of water to be made to the inside pond wall. This is an aerial shot of my own pond which has an ‘irregular circle’ shape. There are seven return lines to this from four bottom drains and three surface skimmers. They all enter the pond in an anti-clockwise direction.